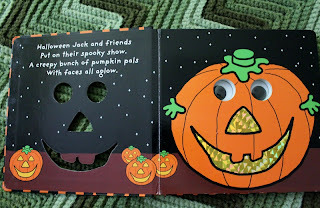 I have been going through our books, looking for Halloween titles. 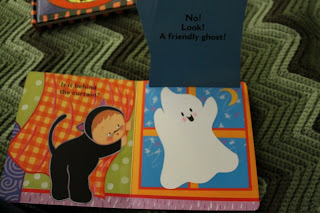 I happened upon the girls' sweet little (neglected) board book collection. I bought special Halloween books for the girls - first Big Sis on her own, then both girls - from work every year. The most beloved of these books would be thrust into our laps year-round. The first one Big Sis chose for herself, right after her first birthday. It was Biscuit Visits The Pumpkin Patch, and I can't find it now. I'm sure that wherever it is, it looks a-fright. It was read and re-read so many times, dragged all over the place. 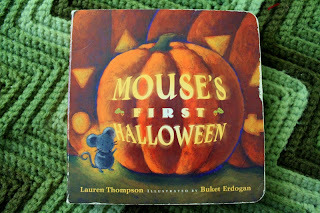 I believe we got Mouse's First Halloween when Big Sis was two. 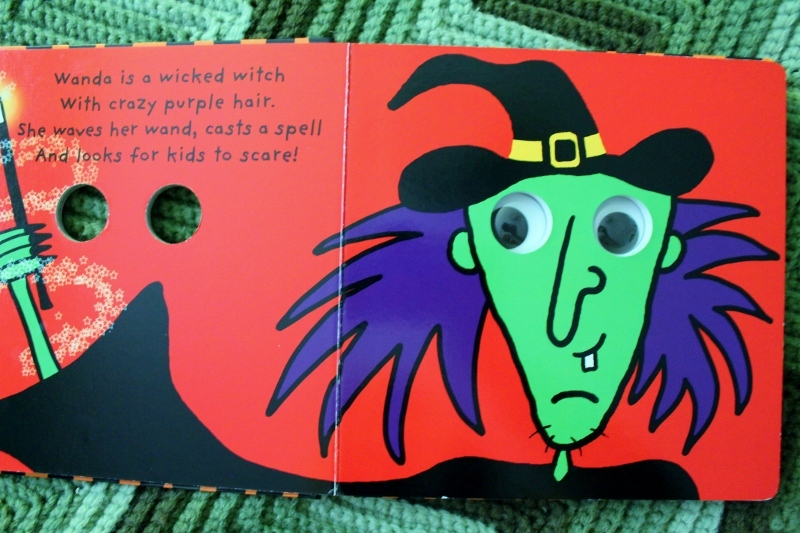 That was the Halloween when she first went trick-or-treating, only I couldn't take her. I had to be at the hospital at 5 AM the next morning for a scheduled c-section. My mom and sister took her. Oh, how she loved this book! I read it a certain way, always squeaking in a very high voice for the mouse. 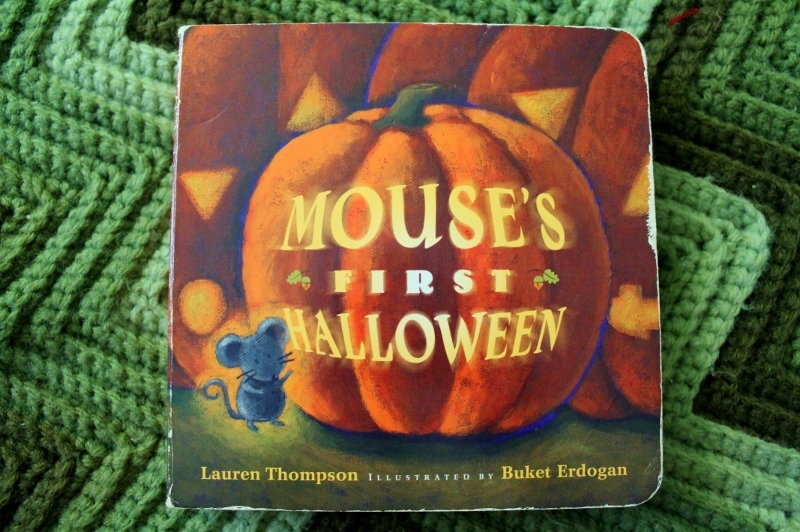 It's a sweet book, as the mouse learns that the scary sights and sounds of Halloween are maybe not so scary. illustrated by Buket Erdogan. Simon & Schuster, 2003. 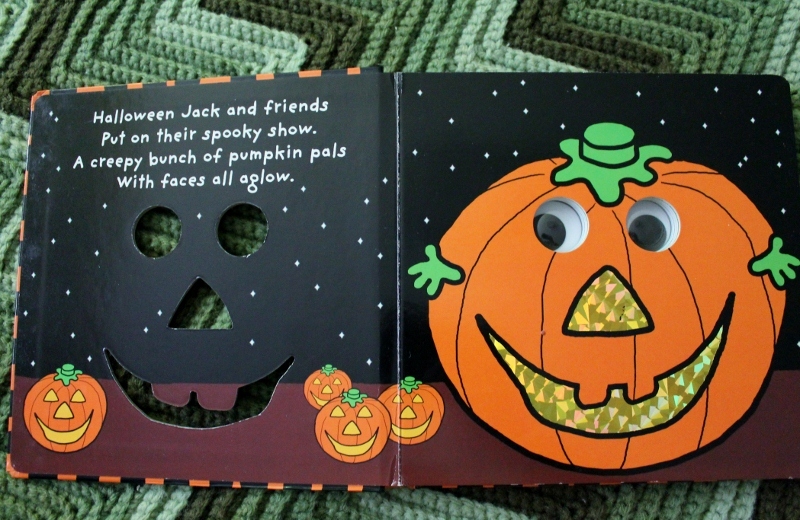 Halloween Jack by Roger Priddy. 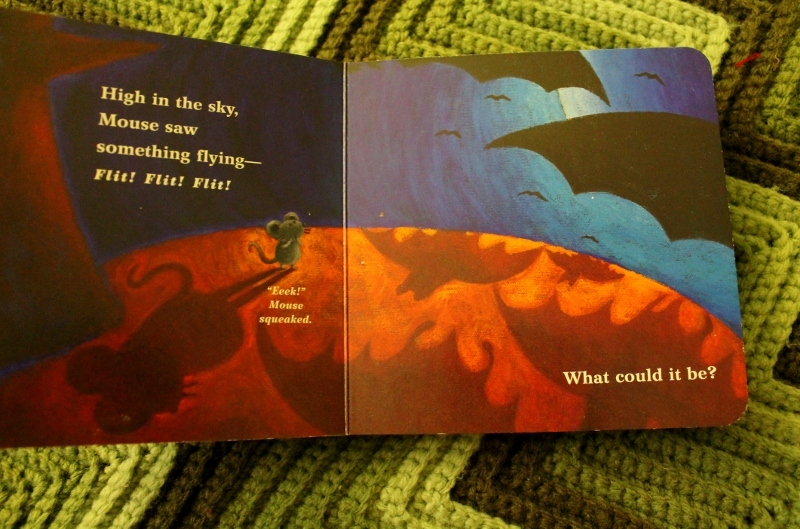 Priddy Books, 2007. I'm Not Scared! was a gift from my sister to Little Sis. We love Jonathan Allen's Baby Owl series. They are not exclusively board books. 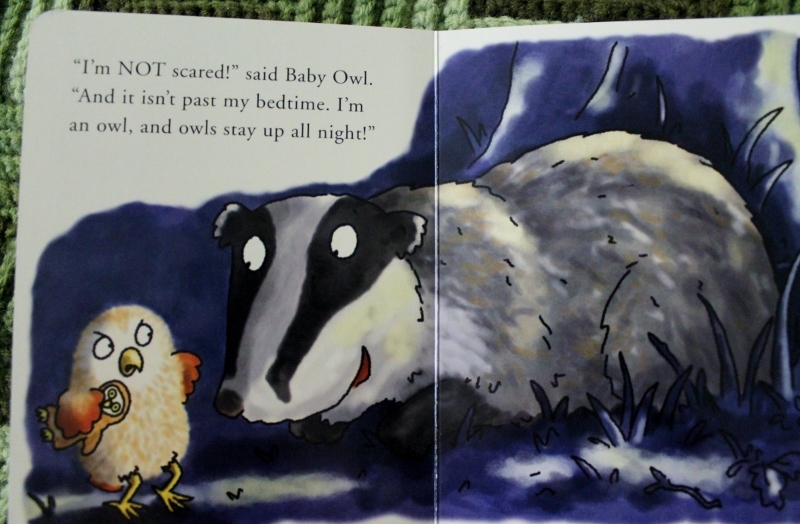 We have I'm Not Sleepy in hardcover. 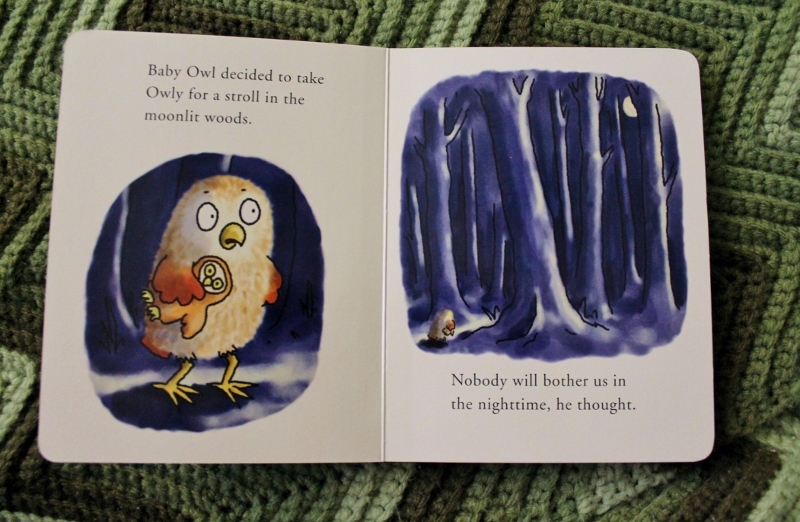 Baby Owl goes for a nighttime walk. He is obviously nervous, but blusters to the animals he encounters, "I'm not scared!" After all, he's an owl. He's nocturnal. He isn't supposed to be afraid of the dark. 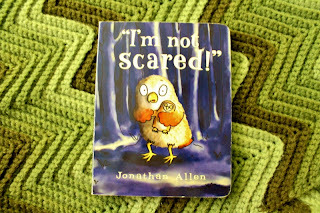 I'm Not Scared! by Jonathan Allen. 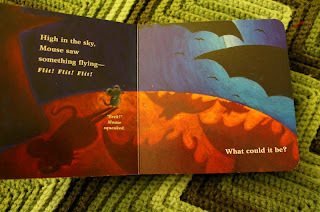 Hyperion Books, 2007. Karen Katz's books have a very special place in my heart. Big Sis responded so well to them when she was tiny. I had her potty book memorized when Big Sis was just over a year old. She adored it. And when she turned two, she made up a song for herself: "I'm the princess baby, on hiiiiiiiiiiiigh!" When she sang the word "high," she'd stop very low then crescendo to a high-pitched, operatic high. I have no clue where this song came from. She made it up in the car one day. She'd outgrown the song by the time Karen Katz released the first Princess Baby book, but we had to get it for her anyway. I think we got Where is Baby's Pumpkin? for Little Sis. It wasn't one I remember reading over and over again. Little Sis didn't have the same reaction to her books. 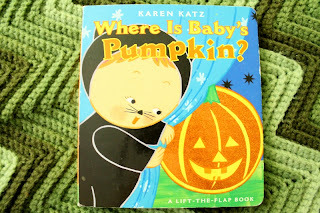 Where Is Baby's Pumpkin? by Karen Katz. Simon & Schuster, 2006. 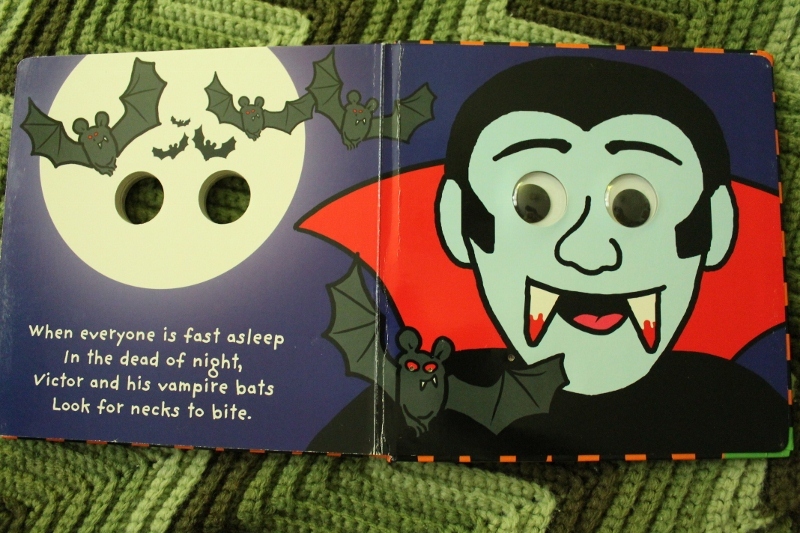 Once in while, I'll find one daughter or the other looking at their old board books. I have a one-year-old niece now. 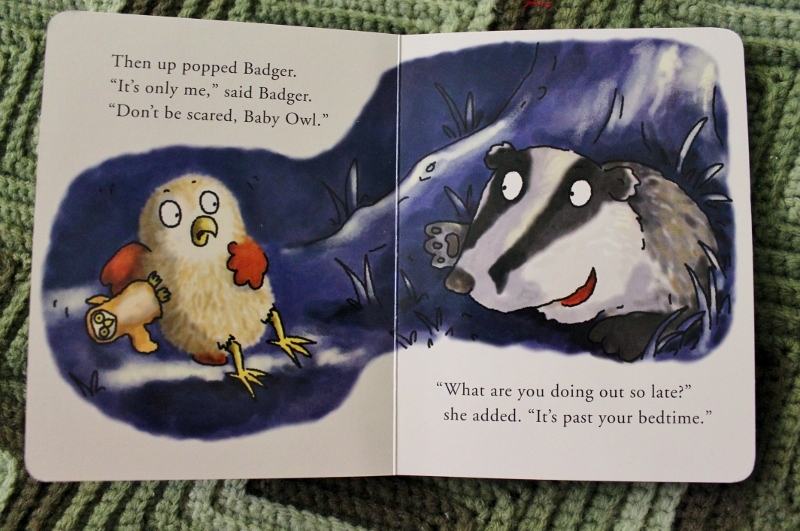 I like having a supply of books for her when she's at our house, but that's not why I still have so many. 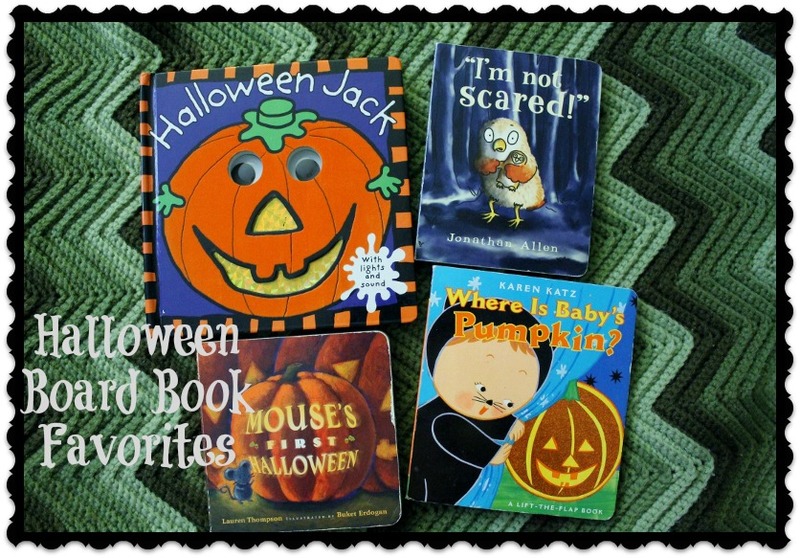 These are the books that traveled in diaper bags or my purse, in strollers and car seats. These books have itty bitty bite marks on them and the flaps on the lift-the-flap books might be torn. 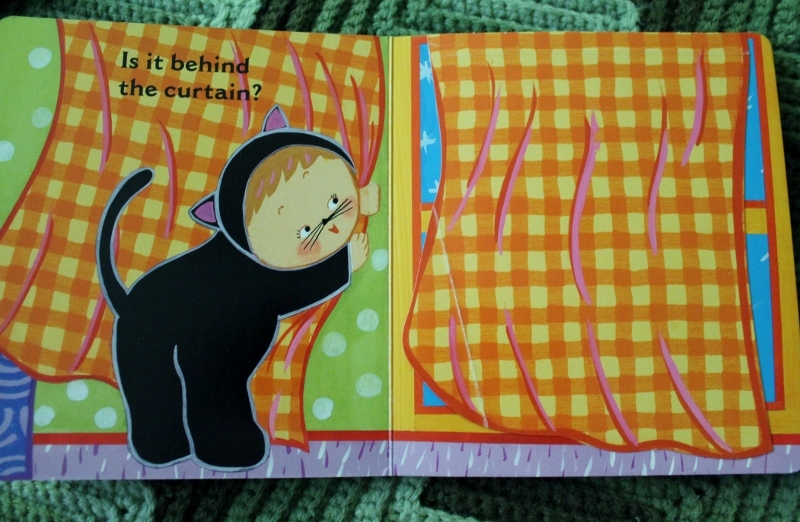 (There's a reason I didn't photograph the complete first page of the Karen Katz book...) These represent babyhood. This time has passed, but it wasn't that long ago. Halloween 2008. Holly Hobbie turned one the next day. Raggedy Ann was three. Oh my goodness! Sweet babies, that photo is a heart melter. Babies get big so fast! Maybe that's why I can't get my mind around not having anymore children? (I'll likely have more, which makes me think everyone must think I'm a crazy person since I already have three.) 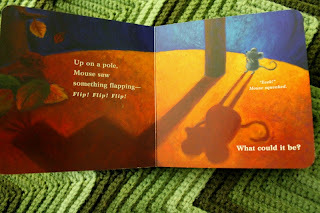 I love it when I see one of my boys reading a board book to themselves... so cute! I found the Biscuit book this morning. 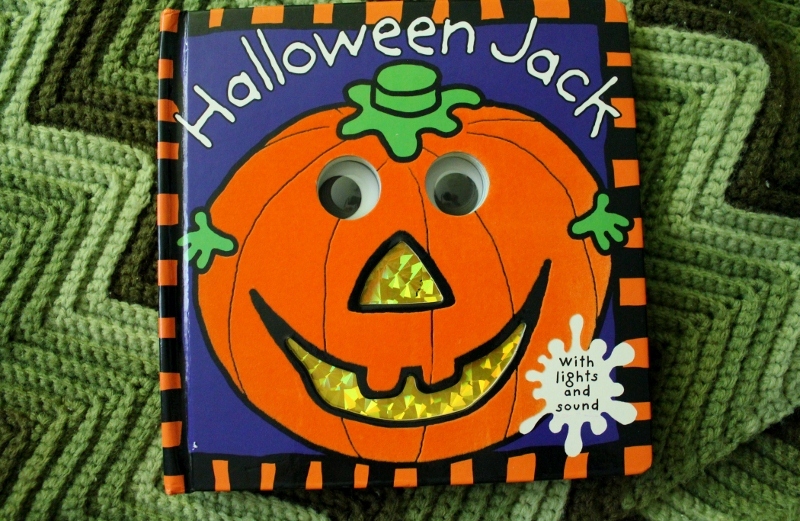 That book drove me crazy back in the day, but I haven't had to read it in years. Sigh. Part of me would love another kiddo, but I don't know where we would put another child in this house. We really don't have room. And I never lost the 30 pounds of baby weight I gained with the first two. And the idea of nursing again, and the fact we'd need a larger vehicle, because our Buick only holds two car seats... I don't think it will happen. Thank you! These are my favorites, too. 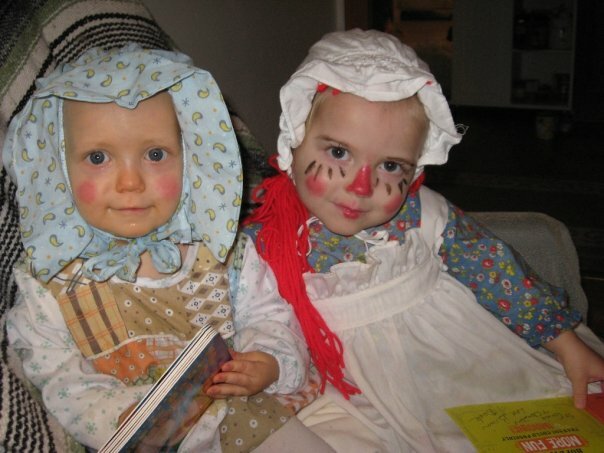 The Holly Hobbie costume was ordered from OneStepAhead.com for Big Sis, when she was one. The Raggedy Ann dress and pinafore belongs to a very large doll that my great-aunt made. I've had her since I was a baby. My mother dressed me as Raggedy Ann when I was little, too. I wore the doll's dress, and she made me a red yarn wig. I cheated a bit - I used an old baby bonnet with a LOT of stretch and attached the red yarn to the bonnet. I plan to go through some old pictures at my grandmother's soon. I hope to find some of me in the doll's dress. And the doll will be seen when I post pictures from Little Sis's 5th birthday party. 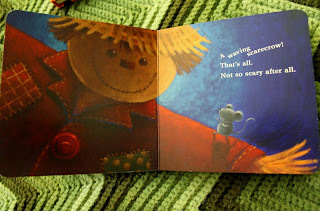 We're having a Raggedy Ann and Andy party! HOLLY HOBBIE!!!!!!!!!! RAGGEDY ANN!!!!!!!!!!!!! those are so darling I can't handle it! 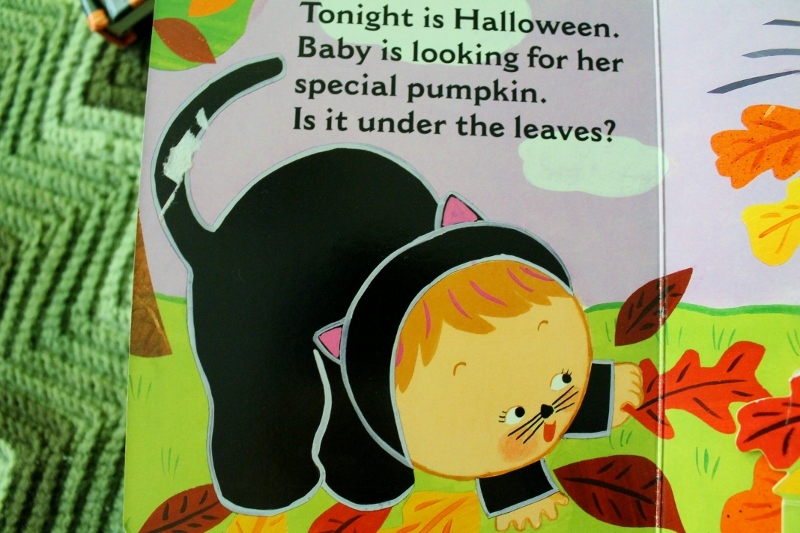 When J was about 8 months old, her first Halloween, we read Where is Baby's Pumpkin over and over and over -- she loved it, and kept loving it -- for about a year, that was her favorite book hands down. 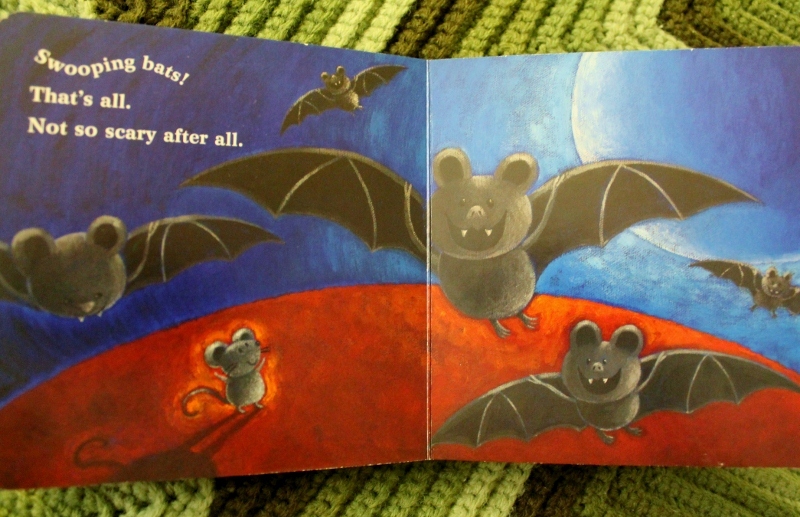 Karen Katz is the perfect baby author/illustrator, I am convinced.